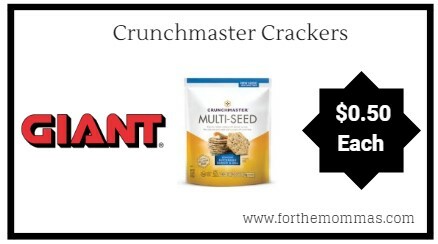 Giant: Crunchmaster Crackers ONLY $0.50 Thru 9/19! Thru 9/19, Crunchmaster Crackers is priced at $2.50 each at Giant. Combine a Crunchmaster Crackers coupon and a Checkout51 rebate with this deal to pick up Crunchmaster Crackers for as low as $0.50 each.